“I expect that all manufacturers, while agreeing with The Stafford Act, believe there is a much better way. Respect for the taxpayer certainly does not appear considered with many government purchases. 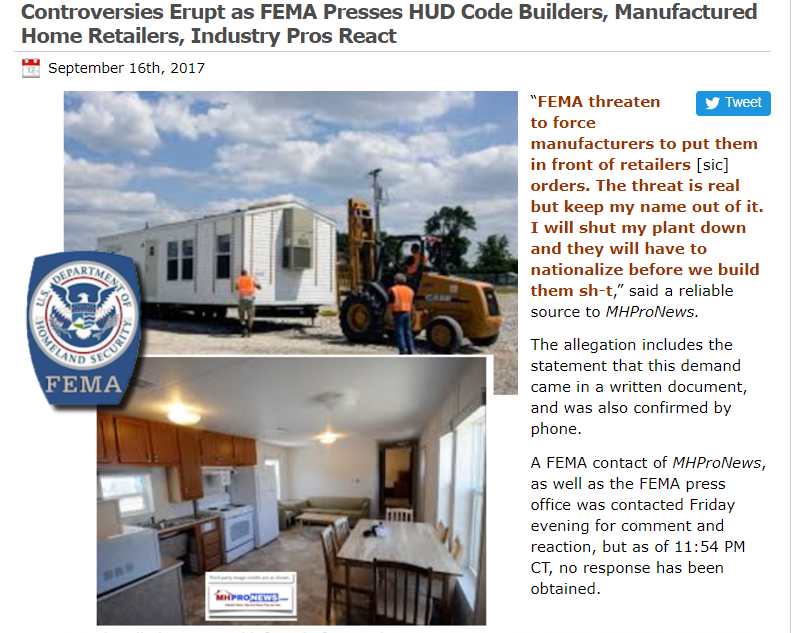 Save the taxpayer money with an adjusted set of requirements, to build MHU units via the HUD code but omit the sprinkler system requirement and many other overreaching requirements. The savings are significant. These comments were shared in response to the story linked above, click for details. Off the record comments are a time-honored tradition in media, which we respect. Naturally, MHProNews routinely seeks to discern how valid (or not) a claim may be, and strives to publish only those that meets that discernment process standards. Save the taxpayer money by eliminating the need for storage yards through the ability to build with inventory manufacturers know they can procure and build almost immediately. The units could go immediately to FEMAs set disaster location and be immediately deployed. The savings could be significant. Save the taxpayer money through a warranty provision that is not punitive for minor cosmetics. Who cares? What family would be ungrateful for an MHU unit with A few blemishes? The savings to FEMA, would be significant. Manufacturers would not have to hedge. Save the taxpayer money by streamlining the inspection processes, the IPIAs that are trusted to inspect/approve our industry’s homes that are bought by hardworking Americans with lenders respecting the loans should be able to inspect Temporary housing units. The savings would be significant. Establish a requirement for care by the residents occupying the unit to protect it, just like any landlord might do. Design the floor plans for resale where the loss for purchase to liquidation is not so excessive. There is much, much more that could be considered. It is not FEMA’s money. It is the taxpayers. I believe our industry believes in a better way!